MADISON, Wisconsin, February 9, 2012 (ENS) – Wisconsin bat scientists are going underground in February to search 120 caves and mines where bats hibernate for signs of the deadly fungal disease known as white-nose syndrome that has killed millions of bats in the eastern U.S. since 2006. While white-nose syndrome has not yet appeared in Wisconsin, the die-off elsewhere prompted the state to add four cave bat species to the state’s endangered and threatened species list last June. The state has listed: little brown bats, big brown bats, the Northern long-eared bat and the Eastern pipistrelle. A fifth cave bat, the Indiana bat, is on the federal Endangered Species List. The new state listing makes it illegal for people to kill, transport or possess bats in Wisconsin without a valid permit. The state’s Department of Natural Resource also has put in place administrative rules that give the agency authority to manage bats and establish prevention and control options. “White-nose syndrome has been wiping out cave bats across North America and it’s on our doorstep,” says Dave Redell, a bat ecologist who leads the Department of Natural Resources’ bat crew. Wisconsin has one of the Midwest’s largest populations of cave bats. Last year, Wisconsin bat crews searched 800 locations without finding white-nose syndrome, but Redell says it would be no surprise if the bat crew finds the disease in Wisconsin caves this year. 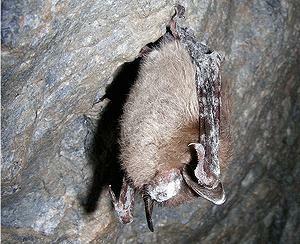 White-nose syndrome is associated with the fungus Geomyces destructans, scientists have confirmed. The Wisconsin bat crew will look for the fuzzy white fungus on the nose, mouth and ears of hibernating bats, and for signs of unusual behavior like bats hibernating near cave entrances where it’s colder or bats flying around outside at night. If white-nose syndrome is found, DNR staff and the landowner will work together to implement a management strategy specific to the site. Management options vary and include decontamination, cave and mine access management, training people how to clean equipment and gear that have been near a cave or mine, cave rehabilitation and possibly disease treatment. As insect eaters, bats keep mosquitoes and crop and forest pests in check, a service one national study published last year estimated at $658 million to $1.5 billion alone for Wisconsin’s agricultural industry. The value of the pest-control services to agriculture provided by bats in the U.S. alone range from a low of $3.7 billion to a high of $53 billion a year, estimated the study’s authors, which include scientists from the University of Tennessee and Boston University. A single little brown bat, which has a body no bigger than an adult’s thumb, can eat four to eight grams of insects each night, the authors wrote. They calculated that the loss of the one million bats in the Northeast has probably resulted in between 660 and 1320 metric tons of insects no longer being eaten each year by bats in the region. “Additionally, because the agricultural value of bats in the Northeast is small compared with other parts of the country, such losses could be even more substantial in the extensive agricultural regions in the Midwest and the Great Plains where wind energy development is booming and the fungus responsible for white-nose syndrome was recently detected,” said Tom Kunz, a professor of ecology at Boston University, another co-author. “We’re at a critical time here for bats and we need help from the public if we’re to save Wisconsin bats and continue saving residents the $1.5 billion in natural pest control they provide every year,” said Wisconsin’s Redell. He urges citizens to take steps aboveground to help keep bats healthy: identify bat roosting and hibernating sites, help count the bats and make a tax deductible donation to the Wisconsin Bat Conservation Fund. More information about these opportunities to get involved in efforts to save bats, and more information on Wisconsin bats and white-nose syndrome can be found on the special endangered species feature page of the DNR website.